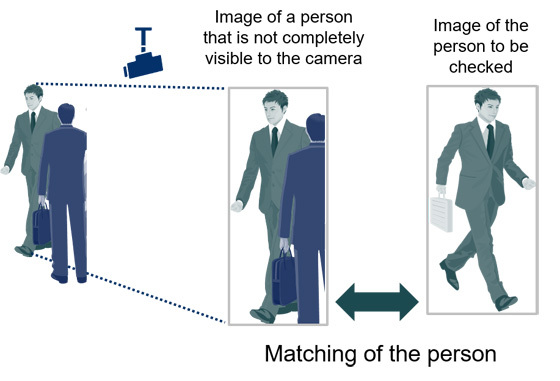 NEC Corporation has announced the development of a "Person Re-identification Technology"
that is capable of matching images of people whose figures are partially hidden from cameras, even if the image is taken from behind or from the side. "NEC has a large portfolio of world-class biometrics certification technologies that include facial and fingerprint recognition," said Masayuki Mizuno, general manager, Biometrics Research Laboratories, NEC Corporation. "We are now expanding this portfolio within our NEC Safer Cities solutions, our NeoFace facial recognition AI-engine that boasts the world's No.1 accuracy, and NEC's advanced video analyzer." 1. Even persons who are not fully visible to a camera can be matched NEC's unique ingenuity in deep learning technology is used to match a person's image by automatically selecting other parts of thier image when there is overlap between multiple people, such as in crowded or shaded environments where a person's full image cannot be viewed. The matching rate for a person is as high as 90%. 2. Matching is possible with images taken from behind or from the side Effective use of deep learning techniques can match people from numerous angles, such as from behind or from the side, and shot with multiple cameras. As a result, this technology can effectively match people using camera images where the face is not visible.